We know that F1 is rather big on nostalgia these days. 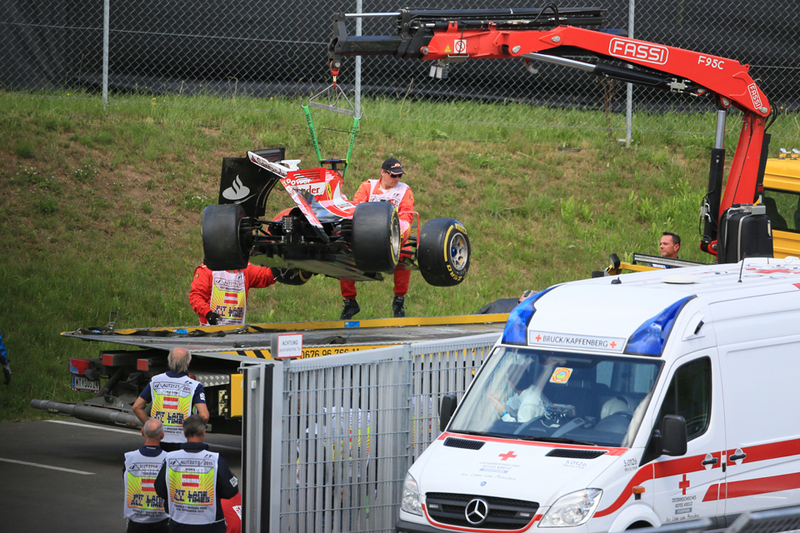 And the response to the parade of mainly 1980s machines brought out prior to today's Austrian Grand Prix was its latest manifestation. No doubt too the self-disgust that pervades the sport at the moment encourages the nagging sense that things aren't what they once were. And yet to borrow from a line of football journalist Raphael Honigstein while modern F1 is drenched in nostalgia it also has no memory seemingly. And not merely because of the base irony of yearning after a turbo era with a strict in-race fuel limit, much brake and tyre nursing and one or two teams miles ahead of the rest. 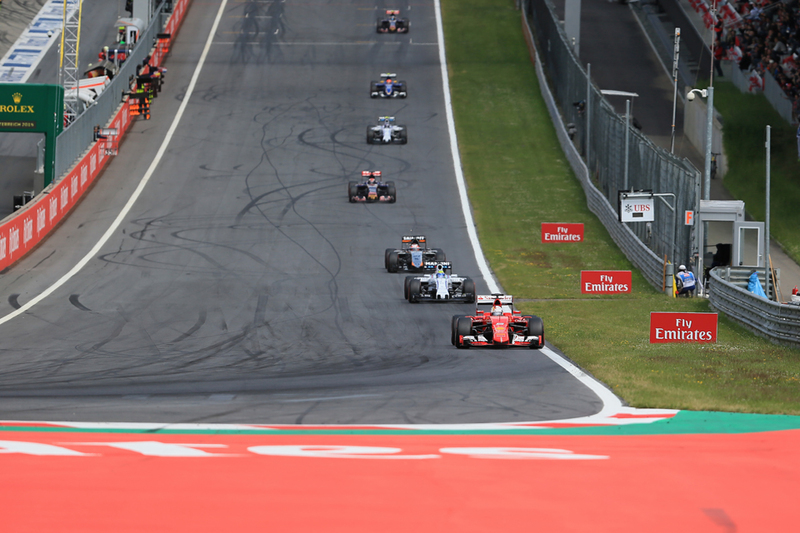 We had another memory failure relating to the more immediate matter of who won today's race around the Red Bull Ring. Lewis Hamilton on pole was bound to win, right? Track position means a lot, particularly in his intra-Mercedes fight with Nico Rosberg, and particularly here? Well, no. Not entirely anyway. We forgot a crucial part. And a perennial one. That whatever is the case in qualifying matters can looks very different very quickly at the get-go of an F1 race. Due to that wonderful thing called the standing start. Today Nico Rosberg got a better launch than Lewis and led immediately - Lewis grumbled later about his clutch while the Merc tech boss Paddy Lowe said "there were some issues with the initiation" - then was able to rebuff him at the next two corners too. 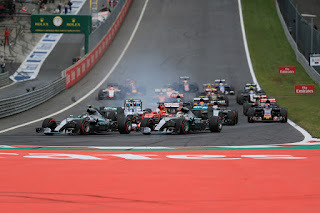 Nico's lead then was firmed up by an almost immediate safety car appearance brought about by a lap one smash between Kimi Raikkonen and Fernando Alonso. Things indeed all of a sudden looked very different. But that wasn't the whole story. We're used to Lewis being the one to instantly scamper off at full pelt as if flicking a switch while all others behind collect themselves in the opening laps. This time in something of a reversal it was Nico that did it. A single tour after green flag racing was resumed he was 1.5 seconds up the road; it was 2.3 seconds three laps later. From then on there was an element of nip and tuck but Nico still all-in edged away and by lap 24 was more than four seconds clear. And his team mate's options were narrowing. Of course in the modern Merc team the guy in front holds most of the strategy aces while today was a one-stopper all round pretty much, further limiting Lewis's options. But even therein he didn't look like doing much. Nico for the reasons cited got to pit first and while by that time Lewis had shaved the gap to around two seconds it almost never looked like enough. Nico then ended most arguments by after his stop immediately lighting up the timing screens - anticipated tyre warm up problems didn't happen in the slightly higher temperatures than on Friday and Saturday - and Lewis had nowhere to go. Lewis pitted himself two laps later and his day then was really done as he managed to veer over the pit lane exit line on his way back out, and the stewards added five seconds to his race time as a consequence. To prevail not only would Lewis have had to whittle down a now sizeable 4.6 second gap and then pass Nico on track he'd also have to get five seconds up the road too. With this mammoth task before him Lewis decided apparently to call off the dogs and follow Nico home. But despite appearances we shouldn't assume that this one was standard. 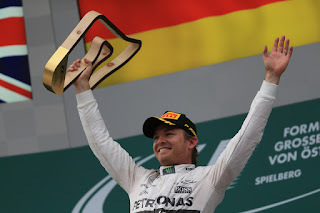 Nico Rosberg won this one fair and square and without being aided by much impediment for his team mate, which despite last year's close battle is not something he's managed to do all that often. Some thought in a lot of ways this was a first indeed. Furthermore aside from a strange outlying lap in the last part of yesterday's qualifying Nico has appeared to have Lewis's measure all weekend. "I had Sunday covered, Saturday not really!" Nico said afterwards in this vein. "It's been a great day. It really worked out well. The start was important and I nailed that...and then after that between the two of us you know when you get in front after the start it's so difficult because we have the same car so unless someone makes a mistake you can't really overtake." Reminding us also of his intricate approach he added: "I was also very happy to have the race pace today because race craft is what I needed to work on a little bit from last year and this year it's really coming good." As for Lewis's penalty, "that just made it a bit easier" noted a content Nico. And while we have a base size of just two already some are musing that it appears that Lewis and this track don't get along. Will Buxton pointed out afterwards that there might be a bigger issue though. Lewis got a new clutch after the fourth race of this season which he said after today's race is not to his liking, and has been unhappy with all of his race starts since. It was also after that fourth race that Nico's run started. Whatever is the case one way or another Nico is making a fight of this. 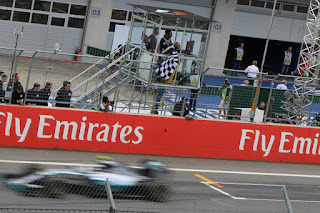 He has now three wins in the last four and is but ten points shy of Lewis in the championship table when most had assumed for weeks and months that the drivers' crown would be a cruise for his team mate. We may not necessarily be getting thrilling races right now but we might yet be getting a thrilling title battle. Whatever is the case too he was simply quicker today and never made a mistake that I saw. His was a masterful and richly deserved win. And Lewis had the grace to accept as much afterwards: "It was pretty straightforward there. Just keeping up with Nico in the first stint, and then in the second stint Nico generally had better pace so he did a fantastic job today, so congratulations to him and otherwise it was just bringing the car home." As for his pit lane error? "I have no idea, to be honest" he mused. 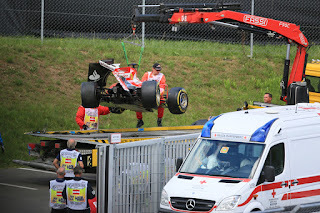 For Ferrari there was a lot of deja vu around in Austria. An encouraging Friday? Check. Race runs that make everyone sit up? Check. It evaporates when it really matters on Saturday and Sunday? Sadly, check. It's worth reflecting too that this has been the case with Ferrari for years - it happened time and again in Alonso's time there too - as there seems to be something about its Friday running that it runs closer to its maximum than is so for the cars around it. Sebastian Vettel afterwards seemed to agree: "I don't think it (the pace) disappeared, I had a good feeling, I think the car was feeling good" he said. "But probably the others were able to find a little bit, very simple to explain...". Indeed the deja vu got a bit spooky for the Scuderia today. As in Canada last time out a red car, this time in Seb's hands, followed the Mercs from the off in third place but couldn't stay with them. Then the team lost the P3 thanks to an error around the solitary pit stop, though this time it was that Seb had a tortuously slow 13 second halt, his right rear refusing to go on. And again this place was lost to Williams, though as with Ferrari it was switched to the other driver, in the Grove team's case to Felipe Massa. In the second half of the race Seb gradually hauled Massa in but when he got there just as was the case for Kimi in Canada he couldn't clear him thanks to the Merc-powered Williams being swift on the straights and the guy behind the wheel making no mistakes. 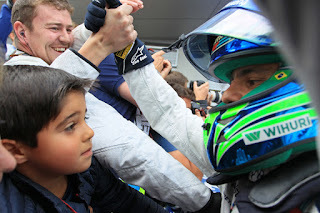 Massa was another to put in a rapid and flawless drive today, and indeed he finished some 35 seconds ahead of his team mate Valtteri Bottas, who was fifth. Bottas spent a lot of the day in traffic admittedly after a compromised qualifying and iffy start, as well as some brake problems later in the race. While another to benefit from Merc power Nico Hulkenberg topped off his impressive week with Force India's best result of the season in sixth. Next up was another Merc-powered runner in Pastor Maldonado and, whisper it, we might just be witness to a reforming character. There have been false dawns before with Pastor of course but with his wretched luck from earlier in the season now passing that's twice in a row he's brought home the bacon with a good result. 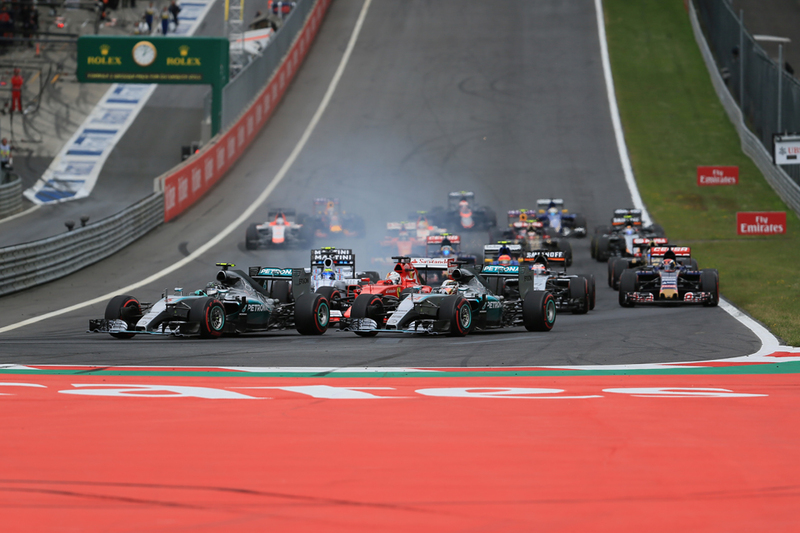 He deployed a back-to-front strategy which allowed a late attack on supersofts and which hit a crescendo with a spirited (and sometimes lairy) late dice with Max Verstappen. Max indeed impressed us yet again and despite not having close to the straightline speed of those around him on this power track still bagged eighth place. It's yet more evidence that whatever Red Bull's woes are they are not down entirely to the Renault engine. No matter what Dietrich Mateschitz, Helmut Marko and Christian Horner keep saying. The home team, well the big home team, had a tough time as anticipated though Daniel Ricciardo managed to scavenge a point after a stretched-out strategy. Daniil Kvyat's attempt to do in effect a no-stopper after changing tyres under the early safety car didn't work and he finished twelfth. 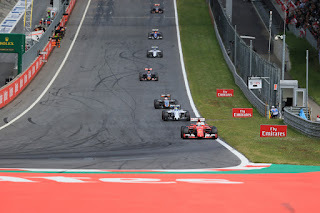 But that team does at least have the meagre honour of having a much better time of it right now than McLaren, which with Honda hit several new lows one after the other in its Austrian weekend. As mentioned Alonso was wiped out by an errant Kimi Raikkonen on lap one who a lot like in Montreal lost it on acceleration (a few additional wolves appear to be circling the Finn's door) while Jenson Button lasted a whole lap longer before his machine once again conked out. Today was one big on reminders as outlined. And in Nico Rosberg's victory we perhaps had the most apposite reminder of all. And on another matter that we are prone to forget. That however tempted we are to finally conclude otherwise he is not one to be discounted in the 2015 drivers' championship fight. Hi Graham, I've also noticed some lack of emphasis on Nico's work this weekend: he dominated the race precisely in the way Lewis was doing at the start of the season, while Lewis himself looked very flaky all weekend. We'll see if this is just a one-off, but I think the fight for the championship is very much alive, and some of the press is still in "Lewis has practically won the title already" mode. 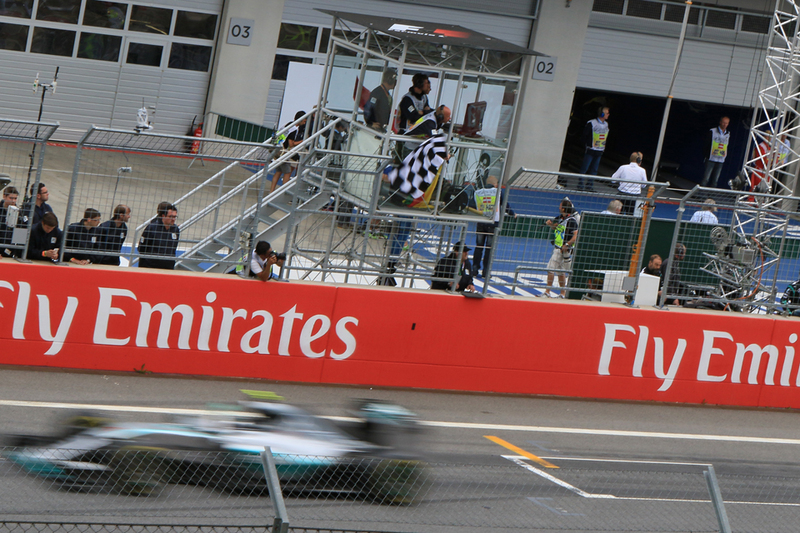 The Hamilton-Rosberg duel is among the most interesting things in modern F1, theirs is an exemplary rivalry. Isn't it amazing how they seemingly force each other's mistakes? Think about Rosberg last year in Monza, botching the chicanes under Hamilton's pressure, or this weekend's double and simultaneous quali errors (I haven't seen anything like that in a long time, if ever). Hi Carlitos. Yes like you it strikes me that not that many are giving the impression that the title fight is really on now; after all it's only a fifth place finish between Lewis and Nico! I think as you say a lot remain in the mindset that Lewis will re-establish control sooner or later. It's understandable given Lewis's form for a lot of this season, and I suppose too time will tell if they're right. Like you too I can't remember a previous time, certainly not in the dry, when *both* the contenders for pole went off like that.